Believe us, we know the feeling — when summer hits, it's always tempting to grab a fork and eat a whole pie on your own. All that fresh fruit and buttery crust is too good to resist; one more bite is always in order. Well, you can put the fork down and pick up a muffin tin instead. 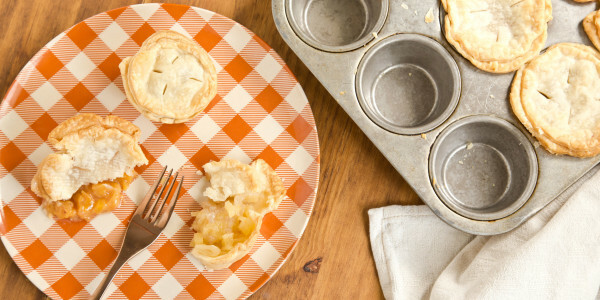 With these miniature versions of your favorite apple and peach pies, you can have all the juicy, fruity satisfaction of summer's bounty without the knowledge that, well, you know, you ate a whole pie. Make these fun four-bite pies completely from scratch with a simple pie crust that comes together easily in the food processor, or save a few minutes with storebought pie dough. You can use blueberries, apples, peaches or even cherries in this recipe. Any way you slice it, it's going to be delicious.